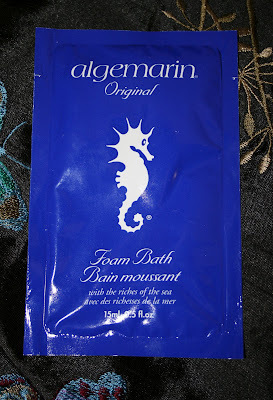 In the March glossybox we all received a bonus item of the algemarin original foam bath. I don't think I've ever heard of this product. However, the scent is *very* familiar to me for some reason. I suppose the packet is a one time use, however as I ran my bath I found I only needed about a third of it, so I'll be able to use it a couple more time. It may depend on how big your tub is or what not. The colour is a gorgeous royal blue pearl. You can almost imagine it as a nailpolish. If you get it on your hands it looks teal. Which is interesting. If you've ever used algae in a powder form for nutrition purposes, you'll know it as a tealy green colour. This does in fact contain algae extract. The scent I think will be a love it or leave it. I love my bubble baths...I usually get pretty floral scents. This scent while not offensive is pretty strong. It reminds me of what bubble bath would have smelled like in the 70's. I know that's so much help to you! ;) It's almost a man's cologne or after shave smell to it. It doesn't smell as strong after you run it through the bath. When you use it in the water, it changes a beautiful teal colour. The bubbles don't last a very long time, but they don't disappear right away. Your skin does feel soft while you're in the bath but it's not a drastic difference. All in all, it's an okay product and I'll use it once or twice more. Whatever the remainder of the packet allows me. I'm not 100% sold on buying the product. I think I would actually have to use it a bit longer to see if I loved it enough. I poked around the net a bit and I did find a main link that is a .ca address. On the back of this sample though it says it's a product of Germany. The prices are 120ml $4.95, 300 ml $10.95, 500ml $15.95, 750ml $21.95. So, it is quite pricey. You can find it at Shopper's Drug Mart, Pharmaplus and Superstore among a few others. "The Health and Beauty secrets of Sea Algae, known by the best Ocean Spas for centuries, are yours to discover at home with Algemarin. Pamper yourself and let the luxury of an Algemarin Foam Bath transform your bath into a private Spa Experience. Algemarin Foam Bath does more than merely cleanse the skin.The carefully chosen Sea Algae extracts in Algemarin gently moisturize the skin and rejuvinate the body with essential marine nutrients. the soothing fragrances, created by European Aromatherapists, calm and relax the mind helping to restore your feeling of well-being." This is a cruelty product. Have you had a chance to try it out? If so, what did you think? thanks for your review! I didn't expect it to be teal! However, after I received it in our glossyboxes I noticed it at the grocery store the other day, so I guess its not as unknown of a brand as I had originally thought! It's funny how we notice things after we actually see them! You probably walked by it a hundred times..hehe! My mom used this long ago before I introduced her to the wonders of Lush so I was pretty familiar with it. Although I prefer my lush bubble bars for sure ! <3 Thanks for the review! Oooohh, I haven't heard of bubble bars! I actually really like the Avon bubble baths because they get ridiculously foamy and they don't leave rings..the tub is actually left pretty clean!